The Triple B Blog Tour! Here’s a book challenge to get you thinking about some themes important to me, and, indeed, important to many of us — the dignity, gifts, and mission of women. 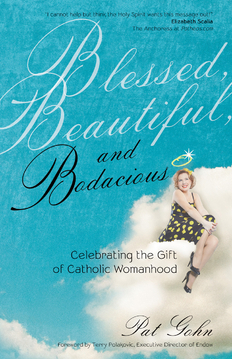 My dear friend, Pat Gohn, just released her first book, Blessed, Beautiful, and Bodacious: Celebrating the Gift of Catholic Womanhood. I promise you, you’re going to want to pick up a copy of this book for yourself, and an extra copy to give away to a woman you love: maybe your sister, your daughter, or your best friend. Pat is a wonderful writer…a real wordsmith with a gift for clear thinking, easy communication, and distilling complex themes into easy to digest thoughts. That’s reason enough to reach for the book, but the truth is that Pat has the heart of a catechist — she loves Jesus and wants you to love him, too! She shares her faith journey with us like a beloved friend, a sister in Christ, and a spiritual mother. I know you’ll love the book, but remember I said Pat is a catechist? Let her introduce you to the beauty of the book in her words and her voice as she explains a fun way to dig deeply into the book. Join me and nine other bloggers as we host a bodacious blog tour over the next ten days and give away copies of the book, too. Think of it as a do-it-yourself retreat! Listen to the audio clip embedded below, and then go to Pat’s blog for more information on Ten Bodacious Basics…Ten Minutes at a Time!